Hafkalk, a family-owned business in the remote Westfjords of north-western Iceland, is currently launching its range of natural food supplements in the UK. The supplements will be distributed by Global Bounty Ltd and are already available through several vendors across the UK. 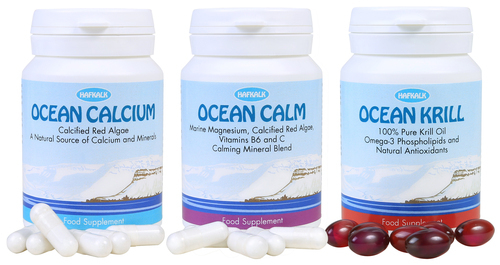 Hafkalk produces its food supplements only from the highest-quality ingredients, sourced both locally and outside Iceland. All products feature natural main ingredients from marine sources, supplemented with high-quality vitamins and minerals to maximise the benefits of these unique constituents. All Hafkalk products are GMO and additive-free.